All components of the ToolMod, ToolKit and ToolMix system are available directly from the factory. Most of the units are in stock or in production so that everything is available at short notice. We will call back as soon as possible if you leave your number. The modules of the ToolMod system are almost identical to the input amplifieres and processing stages of the ToolKit Channel Strip. Here are some photos, basic descriptions and prices of the ToolMod system. Please click to open a high resolution view in a new window. Here is form that can be used for inquiries and general question. Die ausführlichen Beschreibung der ToolMod Pro Audio Serie finden Sie jetzt auf der neuen deutschen analog Pro Audio Homepage. Alle Geräte diese Baureihen sind direkt ab Werk lieferbar. Die meisten Geräte der Tool - Pro Audio Serien sind entweder ab Lager verfügbar oder bereits wieder in Produktion. eine Nachricht hinterlassen. Wir rufen Sie umgehend zurück. Die Module der ToolMod Serie entsprechen mit wenigen Unterschieden den Stufen des ToolKit Channel Strip. Hier finden Sie ein Formular, das Sie für Anfragen, allgemeine Fragen und Bestellung verwenden können. 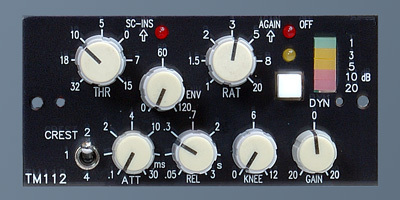 The ToolMod System has + 30 dBu headroom and an input referred dynamic range of more than 120 dB. 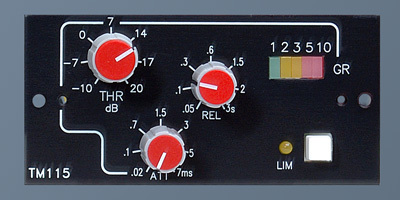 The classical adt-audio Microphone Preamplifier with input transformer, brand Haufe, Germany that is used in thousands of mixing console channels of the 5MT series as ToolMod device. Best noise performance, also with low gain settings and a pristine sound performance that maintains the warmth of the signal in a unique way. 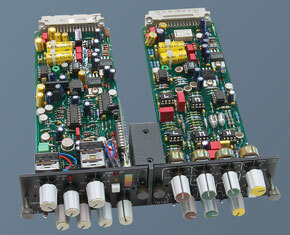 The TM101 has an additional line input and a hi-pass / low-pass filter section with a 24 dB/ slope steepness low cut. 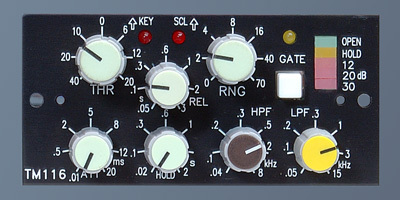 Versatile Compressor with many additional features. Crest switch to modify the rectifier characteristic from peak via medium to RMS mode. Envelope control for easy, low distortion, bass sound compression and soft knee in combination with a very wide attack range for natural sounding settings with huge loudness gain. More features are the side-chain insert and the very comfortable, precise Autogain function. The discrete version of the adt-audio mic preamp without input transformer offers the same superior noise performance as the TM101. However, the input impedance without transformer is much higher. 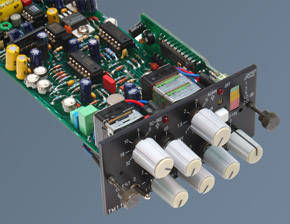 2 switches allow to load the input with resistors and capacitors that can modifiy the sound performance of the microphone. All other features are identical to the TM101 Noise-Gate with a full set of controls for any kind of envelope processing with own, very wide range hi-pass and low-pass filters, key input and side-chain listen. Very fast attack time for problem free processing of criticle signals. Active DI amplifier for guitars and other instruments with high impedance pick ups. The amplifier is designed for this particular use. In addition, there is a high-pass/low-pass filter. 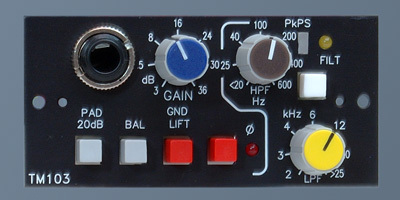 The input pad allows direct connection of guitar amp speaker outputs. The ToolMod 3-band EQ covers a huge range of highly qualified sound treatment. The LOW EQ with its frequency control range down to 15 Hz makes possible a very effective treatment of bass sound and the shelving hi filter with an edge frequency range up to 40 kHz that can produces silky sounds and hi frequency pressure as well. The steepness control offers the choice to change the RC based curve from 6 to 12 dB/oct. 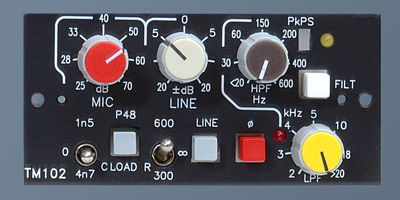 The mid band is the classical 'Wien-bridge' adt-audio EQ. All bands with a boost / cut range of 20 dB make the TM107 much more than 'just a 3 band EQ" - an extremely effective equalizer for any purpose in a very compact format at a low price. 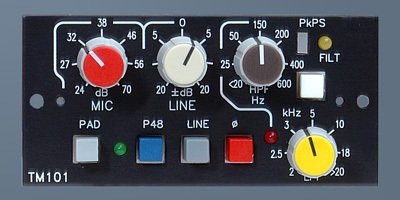 The most popular 5-band adt-audio EQ that is used with the music production consoles 5MT Series D and Series MR since many years. 3 'Wien-Bridge' based mid bands cover the entrie audio band from 20 Hz to 25 kHz with wide overlapping frequency ranges are combined with an RC based, shelving hi EQ und a soft bell type low band for effective treatment of the low frequency range. Hi and low EQ can be switched to different frequencies. All bands have a boost/cut range of 20 dB. A very fast brickwall-limiter with threshold, attack and release control. 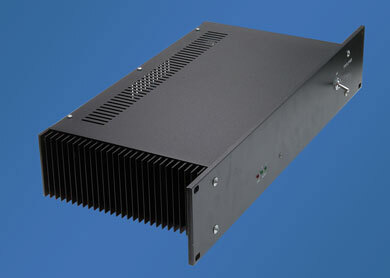 The TM115 is optimized to suppress peaks of several dB in an inaudible way. 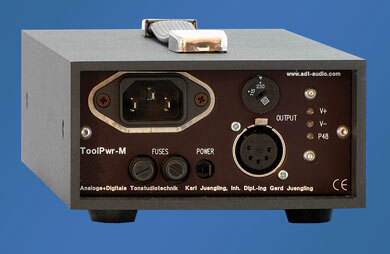 ToolPwr-M is the small power supply unit of the Tool system. The table top housing has the size 120 mm by 60 mm by 275 mm. The capacity is sufficient for 2 or 3 ToolMod frames or other Tool units. 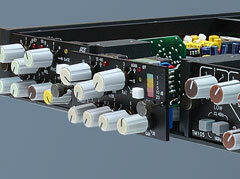 The ToolPwr-S is the standard power supply of the Tool system of pro audio gear. Like the ToolPwr-M it can be used with ToolMod, ToolKit and ToolMix/ToolMst. The capacity of the ToolPwr-M is sufficient for 4 to 6 ToolMod frames or other Tool units. It's a 2U high rack-mounted unit. For more views of the ToolPwr-S click on the thumbnails below. The ToolMod 1U frame can hold 5 'Size A' modules. 2 slots next to each other can be combined to hold 1 'Size B' module, like the TM105 EQ. Each slot has an xlr input and output and 2 TRS jacks. While the xlr connectors are always used for the main audio input and output, the use of the TRS connectors is used for the side-chain insert of compressors, key input of gates, etc. Click on the thumbnails below to view some details of the frame. 5 size A modules in a frame. Any size A unit can be used. 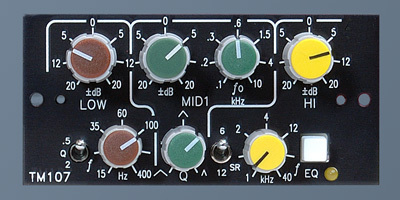 The pictures shows a 5-pack with TM112 compressors. 5-pin XLR cable to connect the power supply unit with the first frame. This standard cable is 10 ft. long. 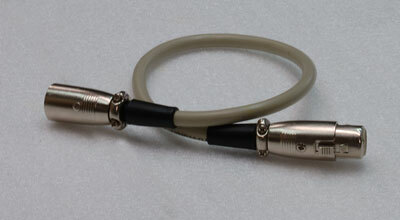 5-pin XTR cable to daisy-chain the power supply from frame to frame. This standard cable is 1 ft. long. analoge + digitale Tonstudiotechnik Karl Juengling, Inh. Dipl.-Ing. Gerd Juengling e. K.